There are two main types of vinaigrette: stable and unstable.The main distinction between the two is the presence of an emulsifying agent. The emulsifying agent is what holds a stable vinaigrette together and makes a smooth, thick emulsion that won’t easily break or split. An unstable vinaigrette is one without an emulsifier, usually consisting of solely vinegar, oil and seasoning. An unstable vinaigrette will split easily and need to be re-mixed before each use. When making an unstable vinaigrette, you usually whisk or shake the oil and vinegar together. This does create an emulsion, but it’s short lived. When the molecules are all broken up and mixed together like this, they begin to seek out their own kind and when they do, they combine and then the different molecular densities of the ingredients cause them to split. The vinegar will sink towards the bottom of the container while the oil will rise to the top. This all happens very quickly, starting as soon as you stop mixing the ingredients. Making a stable emulsion is more scientifically complex, but interesting too. A stable emulsion has an emulsifying agent to keep it held together. Without getting into chemical or commercial emulsifiers, the two most common are egg yolks and mustard. Mustard tends to be used the most because it is safer and it imparts a flavor that is complementary to most vinaigrettes. Mayonnaise is also sometimes used in vinaigrette to emulsify without adding egg flavor. In the stable vinaigrette, the emulsifying agent’s molecules coat the oil molecules, while also being repelled on a very microscopic level by the water molecules in the vinegar. This essentially causes the oil molecules to become suspended in the vinegar, whereas in an unstable vinaigrette, the vinegar was very temporarily suspended in the larger mass of oil. This is much more stable because oil is less dense than vinegar and can therefor be suspended in the vinegar without falling down and breaking the emulsion like the vinegar would when suspended in oil. 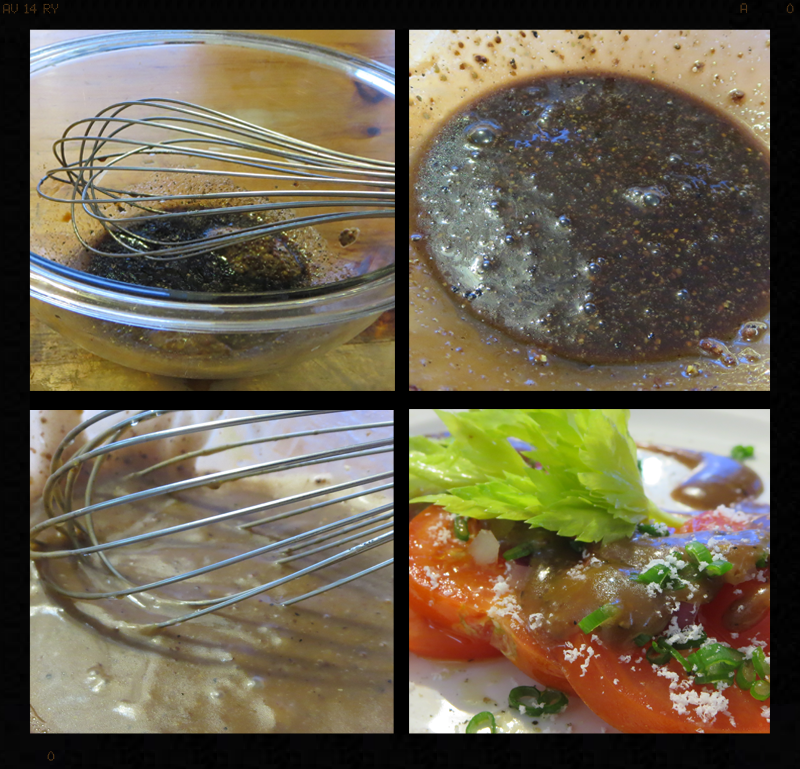 Over time, a stable vinaigrette will still break, but simply remixing it will usually bring it back to it’s former glory. Pour 50 ml of balsamic vinegar into a mixing bowl. This should have resulted in a thick, stable vinaigrette. Taste the end result and make any changes you deem necessary. Don't shake the ingredients together. You can’t guarantee even molecule distribution throughout the mixture, so when it’s put on a salad, one bite may be too oily and another will taste harsh and acidic. It’s better to add oil to the vinegar slowly and whisk while doing so to break up the oil molecules as they are added to the vinaigrette. This creates smaller oil droplets, leading to a stronger and more stable emulsion. Use a squeeze bottle for the oil. It’s much easier to control than a measuring cup or other open container. you don't risk dumping in large amounts of oil. Stabilize your mixing bowl with a towel. Simply make a loop with a kitchen towel and set the bowl inside. This will keep it stable and free up one of your hands to add oil. Alternatively, place a towel along the edge of a shallow pot and set the bowl on top. You can weigh the pot down with water if needed. Always taste the end result. If the seasoning isn't right, you can mix whatever you want to add with some water or vinegar in a separate bowl and then add it to the vinaigrette slowly, while whisking to incorporate. Taste again and repeat until you're happy. With vinaigrette there are endless possibilities. There are so many vinegars and oils to use and when you start making your own, the process only becomes more interesting. Once you have the basics down, you can start experimenting. Add herbs, nuts, puréed vegetables, spices or even liquor. Just be sure you don't go overboard. There’s nothing wrong with simple. You can do whatever you want with your vinaigrettes, so go and try something new. Comment below with your favorite vinaigrettes.